As prosperity trickles down Italy, the vast "south" is experiencing the same sort of revolution experienced by the north. The north simply has had a head start by about a decade or so. Prices of wines produced in the famous northern regions have escalated. People arrive in the shop saying they are "looking for a good $20 Barolo." My response is "Me too!" This is why a look at new and emerging quality wines is worth the "trouble." Some of the grape varieties cultivated in the south offer characteristics which are different from those in Northern Italia (or anywhere else, for that matter). Not precisely "southern Italy" This is located along the Adriatic coast. The most prominent wines here are the white Verdicchio dei Castelli di Jesi and Verdicchio di Matelica. The best known red denominazione is Rosso Conero, made of Montepulciano (85% usually) and 15% Sangiovese. We're fans of Lacrima di Moro d'Alba wines, an unusually aromatic red from vineyards west of Ancona. LAZIO This region is north and south of Rome. Frascati, made of Malvasia Bianca di Candia (primarily) is a famous white wine. Marino, a cousin of Frascati, is also consumed locally. Est! Est!! Est!!! is a famous white wine, made of Trebbiano, Malvasia and Rossetto. We're seeing some interesting wines made of the red grape called Cesanese. ABRUZZO Pescara is the main city in this region. The famous red wine is Montepulciano d'Abruzzo which can have as much as 15% Sangiovese. The white, generally fairly standard (at best) is the Trebbiano d'Abruzzo. Red wine here can be very generous and rather attractively priced. Pecorino can be a remarkably good white wine, along the lines of a minerally Chablis. CAMPANIA This appears to be a potentially serious quality region. Greco di Tufo is a highly regarded white wine (made of Greco di Tufo and, perhaps, Coda di Volpe). Taurasi (sometimes referred to as "the Barolo of the South") is an increasingly famous red, made of Aglianico along with Piedirosso and Barbera. We've tasted old Taurasi wines and wondered if Barolo isn't the Taurasi of the north! Lacryma Christi is a name famed for both red (Aglianico, Piedirosso and Sciascinoso) and white (Coda di Volpe, Greco and Verdeca). Ravello and Solopaca are other moderately well-known names. Fiano di Avellino is a highly-regarded white wine, made of Fiano di Avellino, along with Greco, Coda di Volpe and Trebbiano Toscano. There is much improvement taking place in Campania! 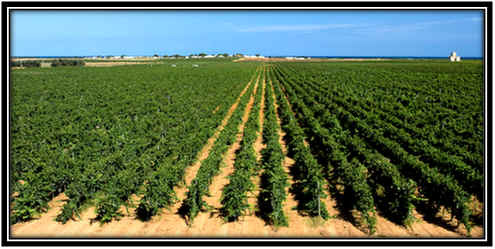 PUGLIA Italy's "heel" is famous for Salice Salentino, a red made of Negroamaro and other assorted varieties. Primitivo di Manduria is thought to be the variety which "fathered" California Zinfandel. Castel del Monte, made near Bari, comes in red, white and rosato. Copertino, from Lecce is a red made predominantly of Negroamaro. Locorotondo, from Bari and Brindisi, is well-regarded in its home regions. CALABRIA Cir� is the most famous wine from the "toe" of Italy, but there are numerous other wines such as Savuto and Scavigna. Gaglioppo is the major red grape, with Greco as a top white wine variety. Another promising variety is Magliocco, capable of producing world class red wine. BASILICATA This mountainous region is becoming well known for Aglianico del Vulture made in the province of Potenza. Some call wines made of Aglianico "the Barolo of the south" and with some credibility, perhaps. It's a wonderfully deep, robust red with a streak of nobility to it. SICILIA The island of Sicily makes an amazing variety of wines! Marsala is world-famous, made in both dry and sweet styles. Malvasia delle Lipari is a terrific dessert wine. Moscato di Pantelleria (also called Zibibbo) can be outstanding. Wineries such as Regaleali, Duca di Salaparuta and Planeta are pushing the name of Sicily into prominence around the world with outstanding table wines. NERO D'AVOLA has arrived in international markets as a well-regarded Sicilian variety. The wines from Etna's volcanic soils can be remarkably fine. Nerello Mascalese is the main red grape there, while whites are usually made of Carricante. SARDEGNA Often labeled by grape variety, wines from this remote island are gaining ground thanks to the Argiolas winery. Sella & Mosca, a huge producer, is famous for its Cannonau (Grenache, apparently) and Vermentino wines. Cannonau di Sardegna is a famous denominazione. Carignano del Sulcis is also well-regarded. Monica di Sardegna isn't some bathing beauty, but a potentially good red wine made of a grape called "Monica." Vermentino di Gallura can be a most refreshing seafood white wine. There's a big production of a white grape called Nuragus which can be good. 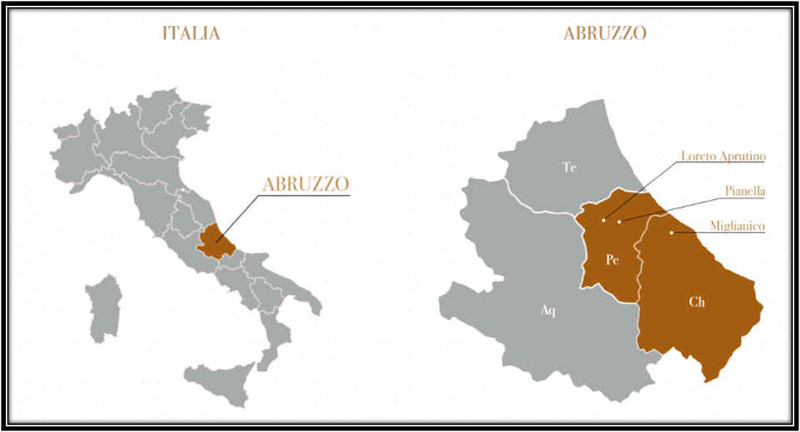 The Abruzzo region catches the warm sun and has the possibility to produce some exceptional red wines. The Pasetti family has been growing grapes (amongst other crops) for several generations and their "Testarossa" Montepulciano, essentially a 'reserve' quality wine, recently caught our attention. Fittingly, young Francesca Pasetti is a red-head! But the "Testa Rossa" name has been associated with the Pasetti's for years, since the typical hat of the region worn by the old-timers was a red cap called "cocciarosce." The family, however, does have a bunch of red heads! Their wine has been imported to California for many years, but only recently was local vintner, Rob Jensen, upset about the label, feeling it may damage his trademark (California's Testarossa winery). I gather the winery, located in Los Gatos, California has been fielding queries from people who've tasted the Pasetti wine when dining out. It's sold by a one-man-band of an importer and he's done well distributing it to Italian restaurants. Consumers, happy with the wine they've had, use a search engine to find "Testarossa" and "wine" and Jensen's winery comes up. As a result of a slightly bitter head-to-head debate over the matter, the local importer had the Pasetti's change the label slightly and now, if you're eagle-eyed, you'll see it's called "Tenuta Rossa." This should placate Mr. Jensen, to whom I suggested he change the name of his brand to "Testa Grigio," since he no longer has the red hair he had in his youth. "This would be truth in labeling, Rob." I told him. The Pasetti's Montepulciano d'Abruzzo comes from older vineyards which feature densely planted vines. They try to pick the fruit late in the harvest season. 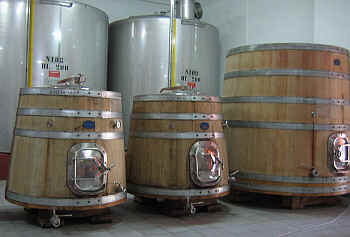 Part of the lot is fermented in stainless steel, part in wood. The wine is matured for about two years in oak. We like the ripe cherry fruit notes and the hint of vanilla and mocha from the oak. You can sense there's oak here, but the wine is not woody or oaky tasting. It's reasonably deep and rich. Drinkable now, this strikingly tall bottle may be cellared for several more years, if you like. Francesca in the sales room. "The secret of our Montepulciano is that the best wines are reserved for aging in wood, while lesser wines are sold in bulk to customers who come for a visit." I found the cellar to be neat and orderly (as it should be). Large Slavonian oak is used to mature some of the "reserve" wines. Customers come with empty jugs and demijohns and they "filler 'er up!" A gas station-like pump and meter measures their purchases. This wine is a good, everyday red, but their "Tenuta Rossa" label is kept in wood and sold in bottles (what a concept, eh?). Some of those bottles find their way to Burlingame, California where they are popular with Weimax customers. People haul their wine back home. Francesca and her folks in the cellar. We can special order their deluxe Montepulciano d'Abruzzo called "Harimann". 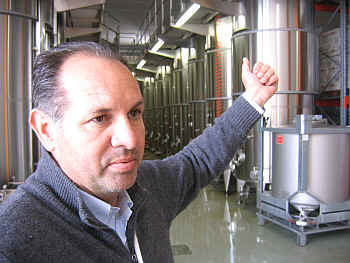 They also produce a Trebbiano called Zarache..
"Mimo Pasetti" who has a nice Tenuta but no rossa on his testa. The whole family in 2015. This is a newish winery despite the fact the Ciavolich family has been there since the 1850s. The family originates in Bulgaria but came to Italy in the 1500s we're told. They sold wool way back when and these days they're esteemed winemakers. They have many stories to tell of each generation, with a winery being built in 1853. The cellars were occupied by German military personnel in the early 1940s Tanks, not of the winemaking kind, were parked on the main floor of the winery while the family and farm staffers were allowed to stay in the cellar. With Allied Foreces making their way north, the German army told everyone they'd better leave and the family fled to Chieti and, eventually Macerata in the Marche region. They have vineyards in Loreto Aprutino and Pianella while the winery is in Miglianico. 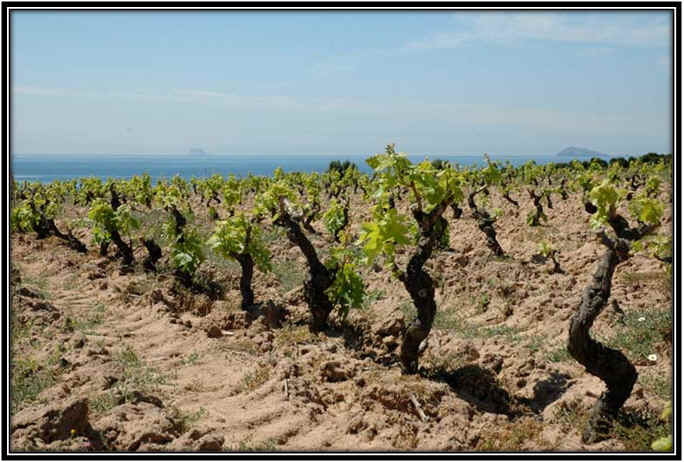 In Loreto they have 22 hectares of vineyard and they also cultivate grain as well as having quite a few olive trees. Pianella is home to another 7 hectares of vineyards and more olives. The vineyards, then, are about 30 to 45 minutes from the cellar. We first met Chiara Ciavolich maybe in 2008, or so. The wines were well-made and of "good" quality. We've tasted her wines from time to time and they've been improving. In 2018 we tasted her wine in Italy and were delighted to find thrilling wines. She's been on a mission to make her mark and it seems she'd on the right track. We particularly enjoyed a white wine made of Pecorino as well as a couple of pink wines. She was interested to see our reaction to a particular red wine she had made a decade ago. It's called Fosso Cancelli which is some sort of reference to the gates of a ditch of sorts. Chiara told us this wine was an idea she had to make some sort of traditionally-styled wine but she was unsure of how it would develop, so she made it in 2007 and 2008 and then stopped, not knowing if the wine would find an audience. It's made entirely of Montepulciano d'Abruzzo and the idea was to leave the wine in a concrete tank for a couple of years. Then, once bottled, it needed time to mature and hopefully blossom. This is taking a sort of winemaking strategy you find in the Douro Valley with Port production: Vintage Port is bottled, typically, after two years and then it's a waiting game. Who does this with red wine in Italy? She poured this wine for us and we swirled and sniffed. We wrote the word "Barolo!" in our tasting notebook. It's a pity she hasn't been making this each vintage since, but she didn't have confidence in this little experiment. She made about 1300 bottles, so there's not a lot of this wine to be had. We expressed our admiration for Fosso Cancelli and she was thrilled to have positive feedback. 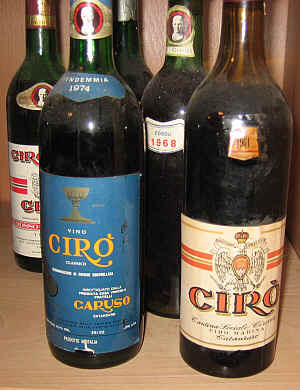 Chiara said she began making this again a few vintages ago so eventually it will re-appear. We have a few bottles of the 2008 in the shop if you want to experience this Abruzzese "Barolo" for yourself. She's taken on a new importer since we first met and this seems like a good move. The new company now has the 2017 Pecorino. This is really delicious and has a fairly complex personality. Chiara's father planted one hectare of Pecorino in 2000 and this was a smart move. The juice is put into temperature-controlled stainless steel tanks and it's allowed to settle before they start fermentation. 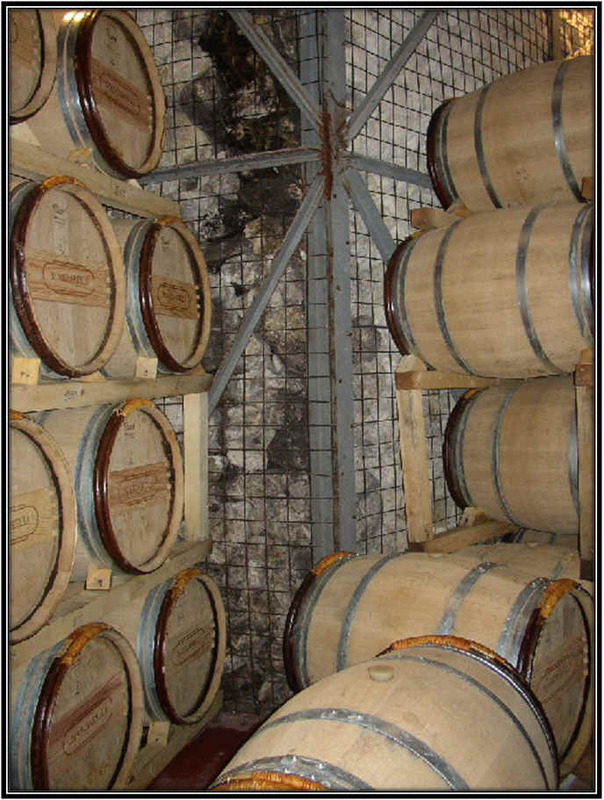 Once the fermentation is complete, a bit of the wine is racked into seasoned French oak puncheons where it remains on the lees for a few months. The two lots of wine are married just before bottling and, "ecco!" as they say. There's a most intriguing character to this wine. We find a faint note of honey and a touch of sage, perhaps. Maybe it's dried flowers? Whatever it is, it's delicious and nicely aromatic. If you're drinking (weak) Pinot Grigio, please give this a try. If you're a fan of a crisp Sauvignon Blanc, this might be right up your alley, too. If you're enthralled with oaky, buttery Chardonnay, you might branch out...but it may not be for you. "The" great name in Campanian wine history is that of Mastroberardino. The family makes claims its winemaking endeavors date back to 1720, well before the 13 colonies joined up to declare their independence from Britain. The more recent Mastroberardino history from, say, the 1950s until the 1990s, has been that of keeping the Campanian "candle" lit. Despite the region having vine-growing and winemaking history going back hundreds, maybe thousands, of years, the region experienced a period of abandonment. Imagine one of the greatest regions of Italy, with a viticultural history of enormous importance, being abandoned! The Mastroberardino family is credited with preserving the local grape varieties, especially Greco, Fiano and the red grape, Aglianico. Over time, the two Mastroberardino brothers (there was actually a third sibling, but he passed away many years ago) and apparently there was a family squabble that caused a "divorce" of sorts. In the period around 1993, the Mastroberardino brothers split their holdings, with Antonio retaining the Mastroberardino label and winery, while his younger brother Walter built a new winery and retained the vineyard holdings. Walter's wife Dora's family actually owned a significant percentage of these vineyards, as it turns out. Her name is Dora di Paolo. Hence the name "Terredora di Paolo." So the Mastroberardino brand actually took a bit of a hit in the mid-1990s, as they suddenly had lost their top vineyards. They've rebounded nicely, as of, say, 2005. Meanwhile, Terredora di Paolo was founded in 1994 and today they're producing an impressive line-up of Campanian wines. One of Walter's kids, Daniela, stopped by the shop in 2013 and was crowing about Campania "not making international wines by cultivating Sauvignon Blanc, Chardonnay, Cabernet, Merlot or Syrah." And when you think about the landscape of Italian wines, so many major (and minor) regions have been dabbling with these "foreign" grape varieties in hopes of putting themselves on the world's wine "map." And we hear Tuscan winemakers boasting about their Chianti, for example, being 10-15% Cabernet or Merlot as though this makes their wine somehow higher in quality. Funny, I've never heard a Bordeaux winemaker bragging about blending Sangiovese into their wines! What grape varieties can be used to "improve" Campanian wines? Do you think Aglianico wines would be enhanced by blending in Merlot? Could Chardonnay make a Fiano or Greco more complex? Happily, up to now at least, Campanian vintners have remained loyal to their remarkable local varieties. And both Mastroberardino families continue to adhere to this tradition. In tasting through the Terredora line-up, you won't find a single clunker. Every wine is well-made and shows a measure of attention to detail in the vineyard. We have a couple of their wines in stock. The 2015 Greco di Tufo is a delight. The Greco grape was originally grown on the slopes of Vesuvius and these days, in the area of Avellino, it goes by the "Greco di Tufo" name. There is, by the way, a town in the region called "Tufo." We view this sort of wine as something to drink in its youth, but Daniela Mastroberardino explained that their Fiano and Greco wines actually can cellar quite handsomely for much longer than most people expect. Anyway, if you don't know Campania's Greco, this is a good one to try. 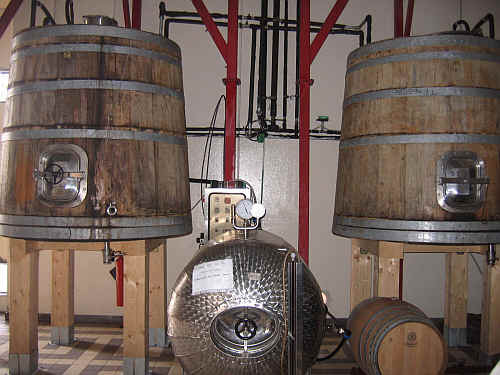 The wine is vinified in stainless steel and gets a bit of aging on the spent yeast sediment. The resulting wine is nicely acidic, dry and fairly crisp. You might find some stony, minerally notes along with a hint of pear and citrus. Match this with appetizers as a cocktail white or pair it with grilled or fried seafood. They make a spectacular bottle of Fiano di Avellino. Their regular bottling is perfectly nice, too, but we're more enthused with the Greco di Tufo for that style of wine. There's a special bottling of Fiano called "CampoRe," located on a vineyard site in Lapio. This is about a half hour drive from Avellino and a bit more than an hour by car from Napoli. The juice is fermented in oak and then half is put in stainless steel and the other half remains in wood for about half a year. Then they two lots are blended back together producing a remarkably complex Fiano which demonstrates this grape has some "stuff." We like the mix of fruit and woodsy elements. There's the toasty quality from its barrel time, but the fruit tones are reminiscent of ripe pear with a touch of lemon. If a winemaker from Burgundy were going to vinify Fiano, this is what the wine would be like. It's a great match for a seafood risotto, but all sorts of fish and shellfish can pair handsomely with this. We have the 2010 vintage in stock and the wine is just reaching its peak, we think. It may be one of those sleepers which can be given extended bottle aging, though. We found their entry-level Taurasi to be especially inviting and the wine is offered at a most attractive price. Compared to the production of Greco di Tufo, this wine is relatively 'rare'! Taurasi, by the way, is made entirely of Aglianico. No Bordeaux varieties or Syrah to fortify the wine or make it taste more 'familiar' to wine drinkers around the world who find Cabernet to be the center of the enological universe. It must be aged for at least three years to get the Taurasi appellation with a minimum of 12 months in either chestnut or oak cooperage. The 2011 spent approximately two years in French and Slavonian oak, but the wood is merely a 'seasoning' for the wine. It doesn't overwhelm the fruit and mild spice notes of the Aglianico grape, though it gives a hint of sweet brown spices. We live in a world where local vintners have moderately tannic Cabernets on the market from the 2014 & 2015 vintages, so it's a delight to visit a type of wine which gets a good deal of bottle aging before it comes to the market (and your dinner table). The Terredora Taurasi is not an old-fashioned, rustic Italian red. It's charming at this stage and a delight with grilled or roasted meats, stews or aged, aromatic cheeses such as Parmigiano or Gorgonzola. 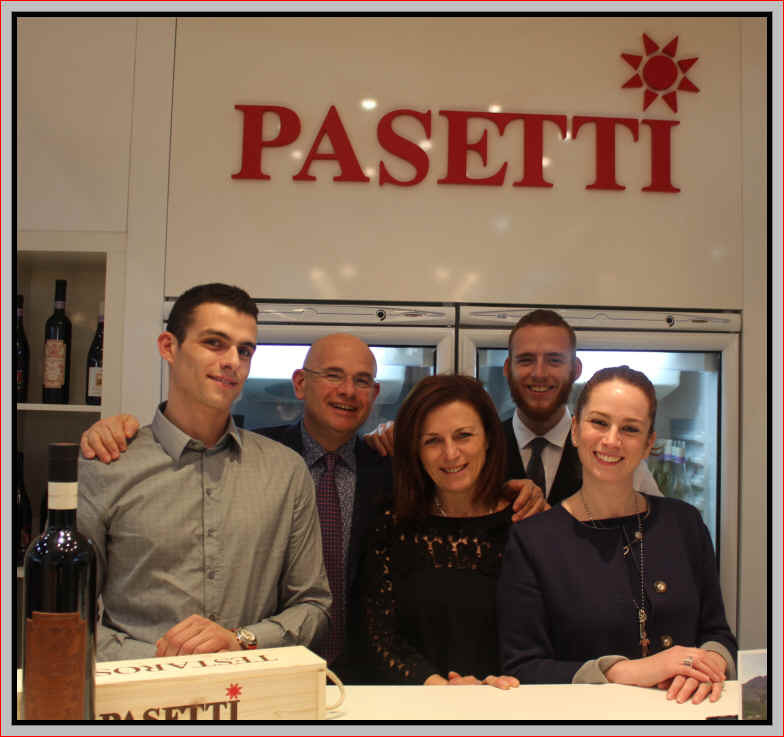 When Daniela Mastroberardino came to our shop, I asked her to tell the crew here which of her family's wines had earned the famous "Tre Bicchieri" award from the Gambero Rosso publication in Italy. Many people selling wine and many buying it have a need to know someone finds the wine in question to be of top quality. But the process of earning a Tre Bicchieri award is very political and the notation is based on numerous factors apart from the good quality of a wine. "We do not have any Tre Bicchieri wines," Daniela informed the crew. The reason is simple: They do not participate. It costs wine, time and money to be "decorated" in various wine publications. And despite the winery being a fairly large producer, they do not feel the need to "buy into" this dynamic. They hope the consumer will eventually find the Terredora wines, like the product because of its quality and honest pricing and remain a loyal customer. This magnificent little winery is a labor of love and it's run by the Lonardo family with the help of some enologists, ampelographers, microbiologists and a vineyard guy, not to mention (but we will anyway) various family members. Alessandro Lonardo founded this little enterprise in 1998. Today it's owned by his daughter Enza, who's a stem-cell researcher at an institute in Naples. Her sister Antonella also helps with the business, as does Antonella's husband, Flavio. The enterprise also serves as a bit of a research lab, which should not be surprising since Enza is a researcher and Flavio is an archaeologist. Their friends and associates have worked on vineyard and vine studies, as well as working on examining various yeasts (ultimately finding, as they expected, that indigenous yeasts yielded more satisfying, complex wines). If you're having difficulties sleeping, they have a bunch of research papers on these subjects. Click Here if you want to read one of these papers...I can assure you, you'll be asleep by the second page! They own 4 hectares of vineyards and rent an additional hectare. Aglianico is their main grape, of course, but they cultivate a bit of Rovello Bianco. It's amusing to see their web site and find numerous articles about this perfectly okay dry white wine that gets more attention, in my opinion, for its rarity than for its quality. It's a pleasant enough wine, but it doesn't strike me as being as complex as a great Riesling or good Sauvignon Blanc or White Burgundy, for example. And their Taurasi wines get some good press, too, but the winery is not well known outside the realm of serious wine geeks. We've tasted their Taurasi wines over the years and these are routinely good. And they lend credibility to the phase claiming "Taurasi is the Barolo of the South." 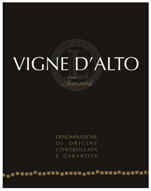 We have their 2008 Vigne d'Alto, a seriously good, but rather young, Taurasi. It comes from a small parcel of roughly 40 year old Aglianico vines. I believe the skins are in contact with the juice/wine for an extended time period, well after the fermentation has completed. 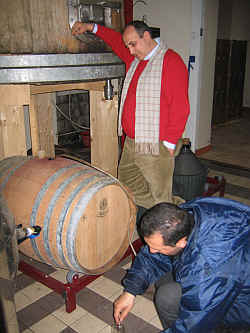 After pressing, the wine is transferred to tonneaux, cooperage larger than a barrique but not a huge wood tank. The 2008 is a remarkable wine...dark in color and showing great concentration of black fruits. There's a touch of an earthy tone, too, with plenty of structure providing good cellaring potential. If you're opening this in the near future, giving it some aeration time in a decanter is ideal. Otherwise, stash this for drinking in 2020 to 2030. Their "entry level" Taurasi is a very handsome wine. We currently have the 2009 and I'd say it's a more ready-to-drink presently than the older, single vineyard wine. The wine is, of course, made entirely of Aglianico. It's aged in "botti di rovere" for a year and a half and then goes in stainless steel for maybe a year. And now it's had a good amount of time in bottle and it's developing beautifully. We like the mild red fruit notes...cherries, raspberry, sour cherry with a mildly earthy quality and a touch of brown spice. It's medium-full to full-bodied on the palate and mildly tannic. It's a terrific example of "serious" Aglianico and we'd suggest decanting your bottle maybe an hour or two before serving. This fellow made some terrific wines in the region of Abruzzo. His basic bottling of "Montepulciano d'Abruzzo" is routinely one of the best bargains known to those in search of a wine with "soul" that doesn't cost a fortune. Gianni Masciarelli passed away during the summer of 2008, but his legacy lives on. We will remember him fondly, as he was a real character and a dedicated winemaker. His wife, Marina Cvetic, is another dynamic character and she's continuing the grand tradition established by her late husband. The new bottling of Masciarelli is probably the best we've had, the wine having a particular character that says "Abruzzo." When you taste this, you'll have trouble believing you paid such a modest sum for this wine. 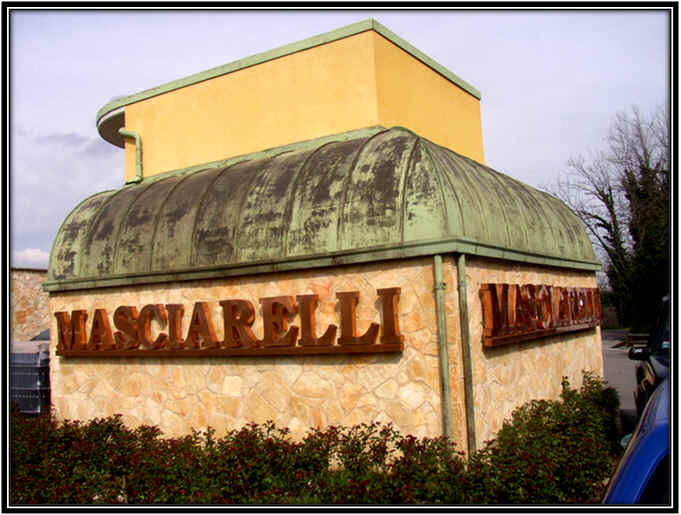 Masciarelli has worked diligently to cultivate good fruit. He uses only his own grapes. The basic, "little" wine comes from nine vineyard sites at various elevation levels. They now have densely planted vineyards in an effort to maximize quality. 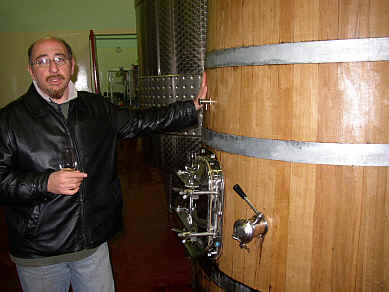 He was such a stickler for quality, he actually went to France every year to scope out wood for barrels for his wines. As I understand it, he went there to actually have a sniff of the various oaks that are available for purchase and then he has the barrels custom-built for his winery! 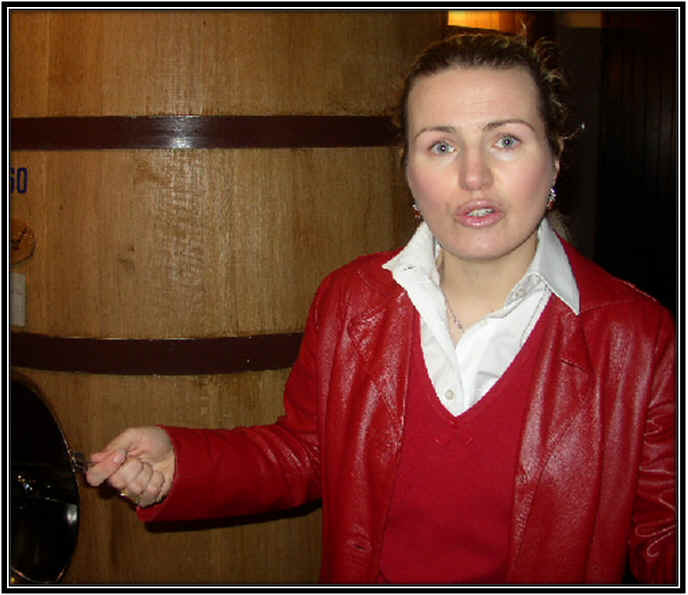 Gianni Masciarelli's wife, Marina Cvetic, now runs the company and her name adorns a very fine bottle of Montepulciano d'Abruzzo of "reserve" quality. The full name of this wine will be a challenge for most: "Montepulciano d'Abruzzo San Martino Rosso Marina Cvetic." The wine is made entirely of Montepulciano. It's fermented in wood and matured in oak. The current vintage is from the 2009 growing season. We have missed several vintages of this wine but are delighted to find the 2009 to be nicely balanced, robust, lavishy-oaked and altogether a delight. The top-of-the-line is a wine called Villa Gemma. This comes from a rather high elevation vineyard and it's been made for about 25+ years now. This is a stellar wine, getting top ratings from all the critics. The wine is matured in French oak, a significant percentage of the barrels being new. The wine displays tons of black fruit aromas and a sweet oak bouquet. It's delicious, now, in its youth, yet seems to have good aging potential. Less than 9,000 bottles are produced annually, so it's not a wine one can easily find. There's a remarkable wine made of the normally "lowly" Trebbiano grape. They have been making this for more than two decades and we've seen a major improvement in the quality of the wine and it is probably worthy of its relatively lofty price tag. The wine comes from 50 year old vines planted in two locations near the winery. The wine is fermented in brand new French oak and then spends, usually, close to two years in wood. I've tasted this over numerous vintages and the current wine, 2009, on a handful of occasions. The wine is a bit chameleon-like: sometimes it tastes like a big, fat oak barrels and other times the wood, of which I know there's plenty, seems to be lurking in the background and the wine is minerally, toasty and nicely balanced in terms of oak. It's a striking wine and if served with equally 'heady' cuisine, the wine is amazingly good. If it's served with lighter fare, the wine may simply bulldoze down the middle of your palate. We had it with some nicely spicy crab cakes--perfect! It's a bit big for simple antipasti, though. Roasted chicken? It's big enough to pair with red meats, you know. If you are a fan of toasty, leesy French White Burgundy, for example, from, say, Domaine Leflaive, this might be worth trying. A change in importers saw the price of this simple table wine increase from $8.99 to $16. 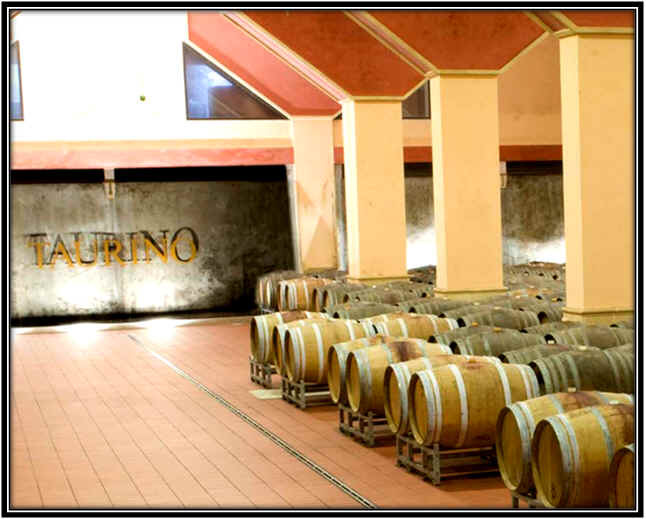 The Rubino family winery is located in the town of Brindisi in Puglia. They have four distinct vineyard sites which are Jaddico, Marmorelle, Ugg�o and Punta Aquila. These are not far from the Adriatic and perhaps a bit less intensely hot than many vineyard sites in southern Italy. The winery was built and started operating in 1999, though the family began acquiring vineyards before that. As a result, they have some fairly old vines (some as old as 70 years) and have worked to plant new vineyards not from nursery clones, but by taking budwood from old, existing vineyards and propagating from those. We're especially fond of Rubino's work with the obscure Puglian variety called Susumaniello. The name of this variety is thought by some to be a reference to abundant yielding vines which would burden even a strong donkey in carting away the grapes. (Somarello is an Italian word for donkey.) We understand that young vines of Susumaniello tend to produce a large crop, but as the roots dig deep into the earth and the vines become mature, production diminishes. The grape fell out of favor as growers, especially those selling fruit to co-operative cellars, made more money with prolific-yielding vineyards and varieties ripening to abundant sugar levels. We're read this variety is thought by some to originate across the sea in Dalmatia, but we see that as a spotty theory. DNA testing shows Susumaniello seems to be an offspring of Sangiovese. The other parent remains unknown, however. The relationship to Sangiovese may help explain the nice snappy acidity to this wine. Rubino makes several incarnations of Susumaniello, even dabbling in sparkling wine. The "Oltreme" wine is made from a fairly young vineyard near Brindisi. What we like about this rendition of Susumaniello is that it's not oak aged, so you get to taste the grape in all its glory. We find this to have a bit of Chianti-like acidity with notes of red fruits not so dissimilar from Sangiovese: cherries and pomegranate, for example. It's a medium-bodied red wine with light tannins. Pair this with a tomato-sauced pasta, grilled sausages, pizza, lasagna, etc. It's best served at cool cellar temp. This place has an interesting history, like many Italian cellars that have been around for a few years. Someone established a monastery in the Ciro' area of Calabria...this would be on the eastern side of the province close to the Ionian Sea. It was in operation, with the brothers planting olives and vineyards in the late 1500s. In the 1770s, the Church was forced to relinquish the property to a private owner and in 1777 the Siciliani family purchased the San Francesco estate. And it was operated by a Siciliani from that time until 2013 when the last heir to that family decided to retire. Since then the estate has been owned by the Iuzzolini family, who own another estate in the same neighborhood, and today you'll find a modern cellar, full of temperature-controlled stainless steel tanks and some wood cooperage, too. The 2014 Ciro Bianco is a delicious wine and it's made entirely of the Greco grape. The juice is cold-fermented and bottled in its youth to capture the fragrant fruity notes you'll encounter on the nose and mouth. We find this to show a mildly melon-like quality and there's a floral note. We also got a mildly minerally character...the soil is clay and chalk, for what that's worth. No oak and it's not high in alcohol. Best enjoyed in its youth. Pair it with shellfish, a light pasta dish or white fish. It'll show well with a seafood salad, too. The Cantele story begins with Giovanni Battista Cantele, a fellow born in Italy's Veneto region. His wife, Teresa Manara, also is from Northern Italy. he had been involved in the world of wine, apparently brokering the sale of the darker, more potent and deeply-colored wines of Puglia to wineries in the North who wanted to "fortify" their local wines. On a trip to southern Italy, Puglia, they were both so enchanted with the region they ended up moving there and setting up a winery. In those days, though, the Pugliese were moving out of Puglia, hoping to find their fortune in the more wealthy northern Italy. Cantele, silly fellow, was leaving the prosperous north for the impoverished south. Their (then) 16 year old son Augusto didn't want to make the move to Puglia and he remained in the Veneto, studying wine and winemaking at the Centro di Ricerca per La Viticoltura in Conegliano. Mom & Dad? They're crazy! But, it seems a few years later, Augusto changed his tune and joined the family in Lecce down in Puglia. And in 1979 the two sons, Augusto and Domenico set up their own winery, initially merely buying wine on the bulk market and bottling it under their own name. In the 1990s they got serious and started buying vineyard land and growing their own fruit. 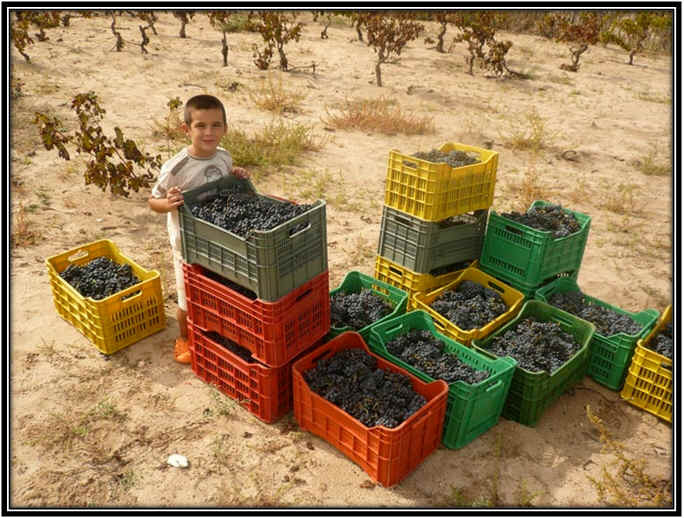 And now a new generation is running the place, as Augusto's son Gianni is the winemaker. They own about 50 hectares of their own vineyards and they buy from or manage another 150. The winery now produces a bunch of wines, including Chardonnay, Merlot and Syrah. 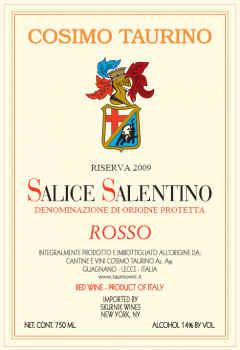 More interesting to us is their "Salice Salentino," a wine made entirely of the indigenous Negroamaro grape. 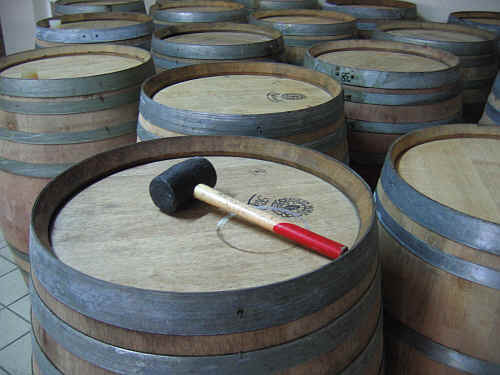 The wine sees a bit of wood aging, though they use cooperage that has had one or two wines previously. The resulting wine is quite good and a satisfying, typical Pugliese rosso. It's not as rustic as the Salice Salentino from, say Cosimo Taurino, which is truly "old fashioned." The Cantele family makes a 21st Century version and you really get your money's worth for $10.99 a bottle. The Argiolas wines have been in our market for a number of years. We've periodically had some of their wines as they seem to be a leading light in Sardegna. We applaud the Argiolas' family for maintaining the traditional grape varieties of their region, rather than jumping into the pool of Chardonnay and Cabernet. So many Italian winemakers feel the need to make the same wines as the rest of the vintners on the planet, they often forget the heritage wines of their backyard. We're presently enthralled by a curious little white wine they offer called Nuragus di Cagliari. The name "nuragus" comes from the nuraghi (stone towers) which dot the island. Nuragus is a grape variety which is said to have been brought to Sardegna by the Phoenicians. That must have been a while ago! our New Year's fest with seared Ahi tuna stuffed with crab meat & basil. 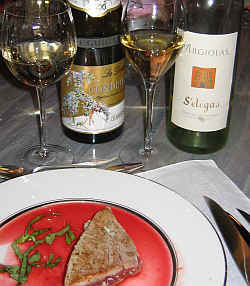 Both excellent wines, but most of us preferred the Argiolas wine. The Argiolas family also offers two stellar after-dinner beverages. 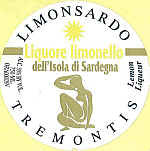 One is a Lemoncello-like liqueur called "Limonsardo." It's actually a shade less sweet than most of the Italian lemon-flavored liqueurs. Very nice, though. Also impressive is their Myrtle-berry infusion called "Mirto." It's dark and deep, with an intense berry fruit aroma and flavor. We can special order other Argiolas wines for you. The Mastroberardino name should probably be better know than it is, as the family is a bit of an icon in the wine business in Campania. The family name is synonymous with Campania, in fact. Though they can trace the roots of the family tree back hundreds of years (and in some aspect of wine), Mastroberardino lost a bit of traction in the early 1990s when the two brothers, Walter and Antonio, split the business. Antonio kept the brand name and winery, while most of the vineyards were retained by Walter, who started another winery, Terredora di Paolo. Back in the 1970s, I recall tasting an ancient vintage of Mastroberardino Taurasi and found the wine to be remarkably complex and something "special." It had withstood the test of time, was deep in terms of its bouquet and had a profound flavor with, still, a bit of 'grip' from tannin. I think the wine was from the 1961 vintage and it illustrated that there was something special about the Aglianico grape, wine from the Taurasi appellation and the Mastroberardino winery. The family remains dedicated to grape varieties which are particular to Campania and they don't dabble in wines with Chardonnay, Cabernet, Merlot or Syrah. They own approximately 190 hectares of vineyards. The family has long promoted sustainable viticulture and are one of nine wineries in some sort of pilot program promoting sustainability. Aglianico is their focus and they make a nice range of white wines, including Falanghina, Greco di Tufo and Fiano. Recent vintages of these have been good and always "correct." The Taurasi denominazione is often referred to as "the Barolo of the south" and this, perhaps is true. 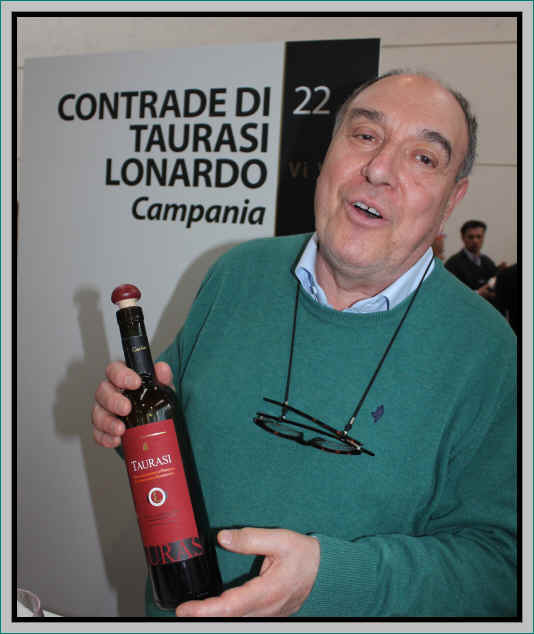 However, we think good examples of Taurasi are wonderful wines and so, perhaps, they ought to really stand on their own. Perhaps one day people will refer to Barolo as the "Taurasi of the north." Aglianico is the grape and this variety can make rather noble, majestic red wines. It can also produce good, simple, hearty red. 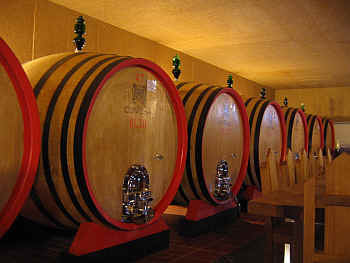 Mastroberardino makes several Taurasi wines. Taurasi "Radici" (refers to "roots", of which an old family such as Mastroberardino has plenty!) comes from Aglianico vineyards which are just attaining a point of maturity. Their best years are ahead of them, but they are making good, typical, "classic" Taurasi. We have their 2009 "Radici" in stock, a wine which spent a year, or so, in a combination of French oak barrels and Slavonian oak 'casks.' Wood, though, is not the dominant feature. There's a woodsy element or brushy tone to the wine with hints of dark fruit and this vintage is fairly firm and nicely structured...certainly approachable now, but even better with an hour, or two, in the decanter. The 1998 Taurasi Radici Riserva was outstanding and comparisons with nicely developed Barolo are justified. The wine shows great depth on the nose with hints of a tarry element which might recall some mature Nebbiolo wines. The 1998 spent a much longer period of time in wood and it's got broad shoulders and plenty of backbone. If you open a bottle in the next few years, I'd suggest decanting it an hour, or so, before serving. Ideal food pairings would be braised meat dishes...lamb, venison, wild boar...you get the idea. We should also mention their Lacryma Christi wines..."Del Vesuvio". The red is made entirely of Piedirosso grapes...Sort of a berryish, mildly spicy red...medium bodied...perfect for grilled sausages & polenta or some other hearty "peasant fare." The white wine is entirely Coda di Volpe, a dry, non-oaked white. It's a simple dry white, grown in volcanic soils. It's a cocktail white and it pairs nicely with seafood and lighter fare. We usually have some bottles of each of these in stock. The family owns a fancy hotel/resort with a restaurant, spa and golf club about 10 minutes north of the town of Taurasi. You'll need a couple of hours from Rome and and hour and a quarter from Naples to get there. Though the late Cosimo Taurino was regarded as an innovator and "modernist" when he started, to us his wines remain very much "old school" and a bit old-fashioned. Taurino was a pharmacist who had a fascination with wine. He established a winery, as we understand it, in 1970. But apparently there was always some sort of wine business, as Taurino sold wine in bulk. 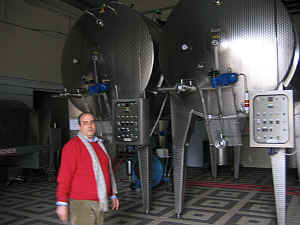 Tankers would be sent, filled with wine, to wineries in northern Italy where wineries would clandestinely blend in the somewhat more potent and darker-colored wine from Puglia. Parenthetically, an enologist told us about some winery in the Veneto using wine purchased from Puglia (not from Taurino) to blend into an Amarone. But the old fellow in the Veneto miscalculated the slight fortification and added too much, making the wine taste more like a Southern Italian red than one made of grapes grown in the Valpolicella area. Oops. In fact, on a recent visit to the Veneto , one prominent winemaker told us of the 250-something wineries making Amarone, probably there are but half a dozen who actually abide by the law and bottle wine solely from vineyards in their area. Using less costly wine from Puglia and other southern areas is too attractive for these wineries to resist the temptation. 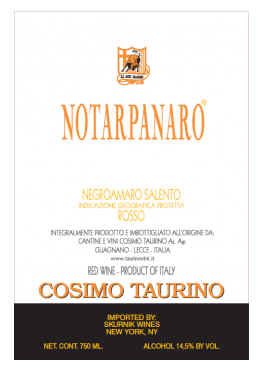 The Taurino acquired a vineyard called Notare Panaro...it was a property owned by a notary whose family name was Panaro. This estate was purchased in 1956. 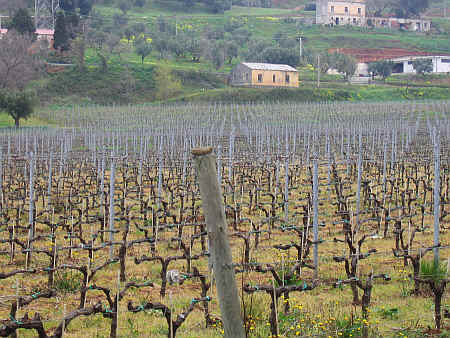 They now have vineyards in two sites, one in the provincia of Brindisi and the other in Lecce. One of the best values in "rustic," classic Italian wine is the Salice Salentino Riserva (the label is posted to the left). This comes from their vineyards in Guagnano. This is the main wine of the Taurino estate and it's about 90% Negroamaro with, typically, 10% Malvasia Nera. If you're looking for a "fruit bomb" or a wine that's lavishly oaked, this is not for you. It's very much "old school" Italian red, despite being in French oak for three months. For those people who are in sync with the wine, it's remarkably good. Soulful. But, of course, not a universally-appealing red wine. Pair it with a savory stew or braised meat. Then there's the Notarpanaro red wine, a wine that's entirely Negroamaro. 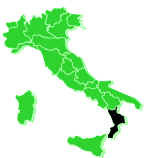 The appellation is Negroamaro Salento "IGP" Rosso. The vineyards are about 40 years of age, so you have very mature vines. The skins are kept in contact with the juice for 7 to 10 days typically, though the fermentation usually goes for two weeks. When the fermentation finishes, the wine goes into small French oak, but the barrels are 2nd, 3rd and 4th use, so the wood imparted into the wine is minimal. It's aged for less than a year in barrel and then it's bottled and given a fair bit of bottle aging before they release it. The foundation of the estate is the Negroamaro grape, though they do grow Semillon and Riesling, despite being situated in a relatively hot region. These grapes are both incorporated into a sweet dessert wine. They also have a bit of Chardonnay and Cabernet. Taurino never was a fan of Primitivo, as we understand, but these days his heirs are making such a wine. So for a winery steeped in tradition, it's interesting that they have a few "foreign" grape varieties and that they use French oak cooperage. I'm guessing Antonio Caggiano is in his late 60s or early 70s. (The San Francisco Chronicle, in a 2004 article by Janet Fletcher on obscure grapes and the wines they make describes Caggiano as a "young revolutionary who has built a modern cantina and overhauled outmoded vineyard practices." I suppose Janet views Robert Parker, then, as a really young buck! Caggiano spent his life owning a construction company. He has been a skilled photographer, too, visiting remote places in search of adventure and the perfect photo. In 1990 he decided to take the plunge and get into the wine business. He started selling grapes back in the early days and started making wine in 1994. Today, with the help of winemaker Marco Moccia and his son "Pepe" (who handles much of the business side of the operation), Caggiano turns out about 150,000 bottles of wine annually. The winery is actually located in the town of Taurasi, so Caggiano really does carry the flag for the appellation. 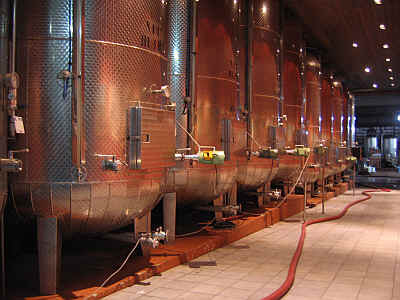 The winery produces several versions of Aglianico wines. Their Taurasi wine from the vineyard "Macchia dei Goti" is the heavy hitter. This is matured in French oak barriques such as the ones in the photo directly above. "Salae Domini" is labeled as Aglianico dell'Irpinia though this, too, comes from Taurasi vineyards. It's matured in French oak, too. Spending less time in wood as it's vinified for immediate drinkability if their "Tari" wine. They seem to be changing the name of this from Tari to Tauri. This used to be an exuberantly berryish version of Aglianico and we liked it served at cool cellar temp with all sorts of Mediterranean fare. It was an "easy-drinking" red. The 2016 vintage, however, is different. This is a wine with a bit more tannin and you could, we suppose, cellar it for a few years with good results. But we find the wine to be something fairly showy on the dinner table with red meats or cheeses. There's an earthy note we find attractive and there's also an element we love in Piemontese Nebbiolo wines. Now you may know that Taurasi wines are often called "the Nebbiolo of the South." If you like the Nebbiolo Langhe wines we typically have in the shop, then this is likely to be a winner for you, too. It's got a similar level of mouth-drying tannin, but it's fuller bodied than the Piemontese wines. A few years ago we we pleasantly "shocked" (more than surprised, frankly) in tasting Caggiano's white wines. They've become seriously more interesting. The wine called B�char (named after a place in the Sahara Desert where Antonio Caggiano had done some photography...he's brilliant with a camera!) is made of a grape called Fiano. This variety can make a really delightful wine if handled well in the vineyard and with competence in the cellar. The 2016 vintage from Caggiano is a very fine example. There's a floral note to this wine...the fragrances are reminiscent of yellow fruit with that floral aspect lurking in the background. No oak and it's dry...nice, lingering finish. It's ideal as a cocktail white, but pairs well with seafood, white meat dishes, etc. Caggiano also has a modest-sized agriturismo down the hill from the winery. It looks like a nice place. The Caggiano wines age much better than has this garlic near the barbecue area at Caggiano's agriturismo. The new Tauri bottle...the old Tari bottle. 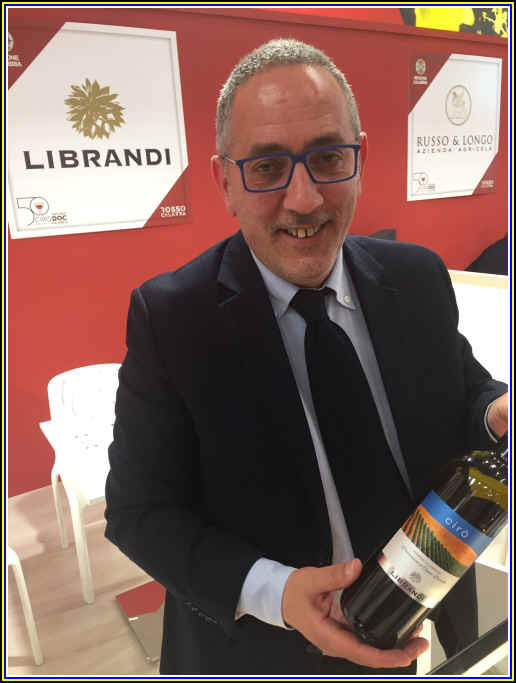 Calabria hasn't been particularly well-known in the international market, though the Librandis are working on changing that. I had thought to go visit Calabria a few years ago and the price of an airline ticket there from, say, Frankfurt, was ridiculously high, so I passed. In calculating the driving time to the Librandi's home town of Cir� Marina, I saw I would need about 6 hours in the car from a location in Campania. This brought home the reality of the American expression: "You cain't git there from here." Is Calabria that far off the beaten path that there is no path? Cir� and Cir� Marina (the part of the town that's right on the water) are on the east coast of Calabria. Cir� Marina is a lovely seaside village with a row of fish stores featuring the day's latest catch. While you might think white wine would be a hot ticket here, it's actually an area more noted for red wines. Stirring the sediment in barrel. Old samples in the cellar. Old bottles dating back to 1970 (on the right). Tasting Cir� with Donato Abenante. Tasting Ciro with Donato in 2019. 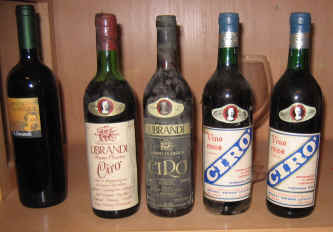 The Librandi family has been bottling wine since the 1950s and, until perhaps the past decade, were one of a dozen producers of Cir� wines. In my view, they're currently the leading winery in the appellation, producing good quality, reliable wines. The firm owns more than 230 hectares of vineyards and another hundred in olive groves. There's a small "army" of about a hundred people who work in the vineyards and a crew of 30 in the cellar. It takes a lot of manpower to make 2,500,000 bottles of wine! 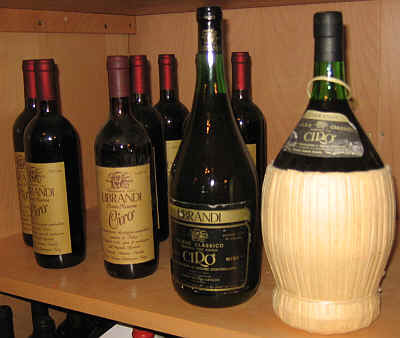 We've been fans of Librandi's basic red wine, Cir�, for some years. It's made entirely of the Gaglioppo grape, which you may know under its Campanian or Basilicata banner as "Aglianico." Years ago, Cir� used to be blended with small amounts of white grapes, much along the lines of Sangiovese in Chianti. Today Librandi's wine is solely Gaglioppo and it's a wine which has a nice level of wood: none. Yes, in a world of wine where oak is highly regarded, Librandi makes its normal bottling of Cir� without wood. This is a nice easy-going red which pairs well with all sorts of simple Italian fare. It's not intended for aging, so drinking it within two to five years of the vintage date is probably about right. Gaglioppo meets the New World in a wine called Gravello. It comes from vineyards south of Cir� in the Val di Neto and it's blended with Cabernet Sauvignon and matured in French oak. The wine is quite good and routinely gains notoriety from various wine journals. I agitated the hell out of Paolo Librandi by telling he and his importer's representative I had no interest in tasting the latest vintage. ((I taste this wine once or twice a year and find it to be quite good.)) I told Signor Librandi, "You know, I've never had a customer request a bottle of Cabernet Sauvignon that's been blended with Gaglioppo." Besides, Gaglioppo is particular to Calabria--Cabernet is grown all over the planet. Do they need to grow it in Calabria, too? Do Bordeaux vintners ever think to blend their wines with Gaglioppo, I wonder? Another grape we've enjoyed from Calabria is Magliocco. This variety had been thought to be Gaglioppo, but recent studies indicate it is not the same and it's a completely different variety entirely. The Librandi family says this variety is ancient, dating back to Roman and Greek times. They've been dabbling with Magliocco for a number of years and in this past decade have been making some remarkably good wine of this grape. We can special order the Gravello and Duca San Felice wines for you...Maybe some of their other offerings, too. Please inquire. 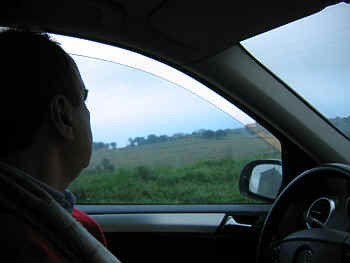 Older Americans know the Mancini name...they associate it with a music composer and arranger, the late Henry Mancini. Younger folks will ask "Who the hell is Henry Mancini?," but if you've ever seen those Pink Panther movies, you might recognize some of his work. Piero Mancini was not a musician, however. He was a dentist. And he invested his earnings starting in the 1960s. By 1980 he had about 70 hectares of vineyards, though it took him until 1989 to build a winery, vinify his own fruit and put his name on the label. Today the winery is run by his widow Marisa and their three kids. The 2016 is definitely "on," as it's a terrific example of Vermentino. Bone dry, no oak and displaying the melon-like notes of Vermentino with the typical hints of spice...great as a cocktail or aperitif wine and, as you might expect, it's perfect partnered with seafood. Virtually every write-up of Vermentino routinely mentions its French synonym, Rolle. We're not going to do that, since virtually nobody outside the wine business has any clue as to what Rolle is and most wine drinkers don't care, anyway. I might point out that a number of Vermentino wines coming to the US market are being made to the specifications of national importers or local marketing gurus. As a result, you will find many Vermentino wines to have a bit of residual sugar. Mancini makes its wine for adults and they don't offer a special "American bottling" that's been dumbed down for the masses. And this has more character and charm than the mass market Pinot Grigios populating grocery store shelves. We are big fans of this wine and it remains reasonably priced. The story of this little Basilicata producer begins in Tuscany, where Fabrizio Piccin was making Vino Nobile di Montepulciano, as he had been doing for a number of years. But curious about other grape varieties, he and his wife Cecilia were fans of other "important" Italian grapes, so they enjoyed Nebbiolo from Piemonte and the Aglianico grape from Basilicata and Campania. In fact, he liked Aglianico so much, he was making periodic trips to taste and explore the world of Basilicata and Campanian wines. In the late 1990s he was buying grapes from growers and dabbling in making Aglianico wine and soon he was bitten by the bug. By 2004 they sold their Tuscan vineyards and winery, bidding a fond "Ciao!" to Toscana and they bought some vineyards in Basilicata where they designed and constructed a wine cellar. Today the couple owns about 18 hectares of Aglianico in Basilicata split amongst four sites. Maschito has 30 to 40+ year old vines, while Rapolla, Venosa (young vines) and Ginestra (30 year old vines) account for their fruit sources. They employ open top fermentation tanks, use indigenous yeasts and various sized cooperage. We've liked all their red wines, but had featured the "Gricos" bottling, a youthful and charming Aglianico that's intended for immediate consumption. The wine is lightly tannic, but tastes much smoother when paired with food. It's a bit reminiscent of Zinfandel wines from California which we enjoyed in the 1970s...not too high in alcohol, berryish and with hints of pepper spice notes. The most recent vintages we have tasted were a bit less bright and seemed to have some unusual fragrances, so for now we're "on hold" with this Aglianico. Imagine living in an area of an active volcano and cultivating grapevines in such an environment! That's the story of a special region north of Napoli in a zone known as "Campi Flegrei." Scientists believe there were eruptions in this area 35,000 years ago. Then maybe 12,000 years ago there was another incident. Much more recently, in the early 1500s, people noticed the ground was shaking and then in 1538, around what we'd expect to be harvest time, there was a major bit of volcanic activity and a new 'hill' was created. It's called Monte Nuovo. But there's been rumblings in the late 1960s and then again in something like 1982 through 1984. German drilling experts noted they are monitoring the area and have sensed some sort of activity in the early part of 2013. I'm not sure we can accurately describe the wines from the Campi Flegrei as earth-shaking, but the wines from this area have a measure of distinction and they certain provide pleasure for those of us on the other side of the planet, far away from the seismic/volcanic activity. 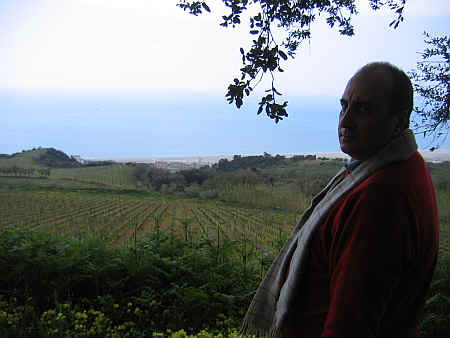 Luigi de Meo cultivates the white grape called Falanghina, a variety found in other parts of Campania. However, these vines are not grafted onto rootstock, they're grown on their own roots. 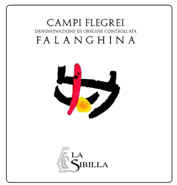 We understand there are some genetic differenced between the Falanghina of the Campi Flegrei and other areas. Di Meo typically harvests the first part of October, so the Falanghina gets a lot of 'hang time.' This may account for its beautiful character. We enjoyed a bottle recently after tasting dozens of California wines. What a welcome relief this was! It's a bone dry white wine with some stony notes on the nose and maybe you can sense a whiff of the sea air. It's not given any time in wood and this allows the character of the grape and vineyard to shine brightly. Pairing this Falanghina with seafood is an ideal match. We enjoyed a bottle with mussels and some grilled octopus. The octopus was served on a bed of beans which had a note of Meyer lemon...what a glorious marriage that was! Grilled Octopus on a bed of Beans with Calabrian Chili, Meyer Lemon, Bottarga and a Fresh Tomato Sauce...beautiful paired with la Sibilla's Falanghina! We understand Julius Caesar was a fan of the wines from Messina, a small wine growing region in the shadows of Mount Etna. Here, in north-east Sicilia, one finds an interesting production of unusually elegant red wine. Over the past few years we'd had the Faro of the Palari winery, the early leader in the appellation. It seemed to us, though, that the Palari wines kept getting bigger, more potent, more inky and more intended for those critics who have a passion for numerically scoring every wine they taste. And that's the key: they only "taste," they don't drink. 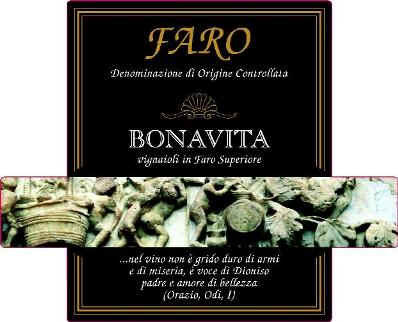 The Faro area is situated in the northeast corner of Sicily and there are about 16 growers of grapes of this appellation and perhaps 13 wineries in production presently. Although the word 'faro' translates to 'lighthouse', it's been suggested the name comes from an ancient colony of Greeks who were "Pharii" from the city of Pharis. 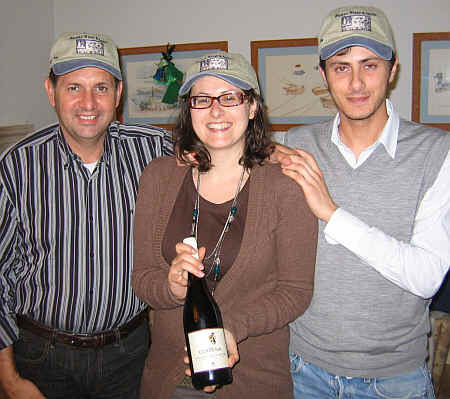 The Bonavita winery is the work of the Scarfone family: Emanuela and Carmelo and their two sons, Giovanni and Francesco. The estate covers approximately 6 hectares, but only two have vineyards. They cultivate just the three typical, local varieties, Nerello Mascalese, Nerello Cappuccio and Nocera. The first two give body and complexity, while they Nocera is blended in to add some structure and acidity. The current DOC laws require minimum and maximums of each of these: Nerello Mascalese from 45% to 60%, Nocera from 5% al 10% and Nerello Cappuccio from 15 al 30%. The grape known as "Calabrese" (Calabria's Gaglioppo, which is said to be Campania's and Basilicata's Aglianico) and Sangiovese can each account for as much as 15% of the blend. The Scarfone family vineyards range in age from about six years to 50 years...the wine sees a fairly traditional vinification, with 12 months aging in oak. We like the dark cherry fruit notes and the woodsy tones from the oak. The 2007 is showing beautifully and is quite enjoyable right now, though it may be held for another 5-10 years. The wines of the Odoardi family are unknown to most people...And yet they're a reference point for an obscure appellation on the west coast of Calabria. They are the sole proprietor of Scavigna-designated wines and make about 60% of the Savuto appellation wine on the market. 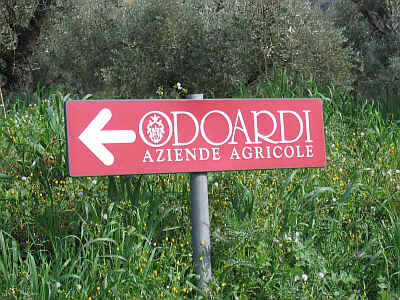 The Odoardi brothers have about 95 hectares of vineyards and even more land devoted to olives. They claim to have been founded in the year 1480. 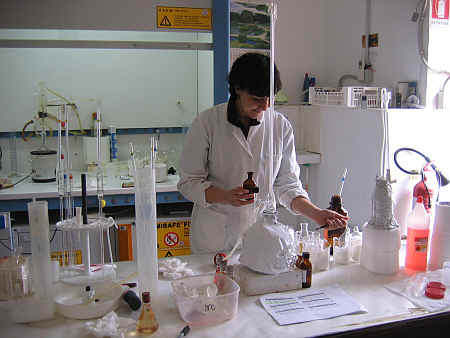 The family works with the University of Calabria in researching various aspects of viticulture and enology. Gregorio Odoardi's schooling was in medicine and he's a radiologist in "real life." We got into Odoardi's wagon and he drove around the various terraced hillsides, showing off their vineyards. We're quite close to the sea. Gregorio is an ardent chain-smoker. Those little ropes he smokes are amazingly pungent and the tasting room window is opened maybe once or twice annually. We discovered their wine far away from the winery though. We've had this obscure little treasure for several years. Our late colleague Bob Gorman used to buy a bottle of Odoardi, saying it's one of the best deals one could hope to find. It's a blend of 45% Gaglioppo, 15% Greco Nero, 15% Nerello Cappuccio, 15% Magliocco Canino and 10% Sangiovese. 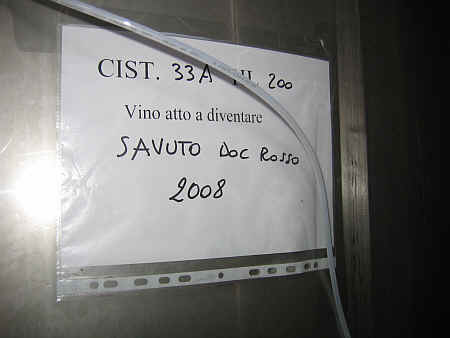 It is kept for about a year and a half in stainless steel tanks, so if you're looking for a wine with oak, Odoardi's Savuto won't do. I read some critic's evaluation of the wine and the words "smoke" and "tobacco" were part of the tasting notes...and you might find these elements in this wine, even if you're not sitting next to Dr. Odoardi while he's puffing on a Toscano! The winery is quite young, but the vineyards are aged. The enterprise got its funding from a Piemontese foundation called "Giov-Anna Piras" and it's run by Flavio Piras. They have a museum of sorts in Torino where they feature a remarkable collection of art, music and photography. I understand they have more than 50,000 vinyl records in their collection, plus 35,000 pieces of art, literature and film! Sardinia is a home, of sorts, for the Carignane grape, called Carignano there. This is a variety which, when the vines are young, typically produces a bountiful crop. When the vines are old (40-50 years, or more), the production drops to a more sensible level and the quality can be rather remarkable. So the Giov-Anna Piras foundation funds a little winemaking project on Sardinia and it's called 6 Mura. We understand the project brings together 5 friends who are from the town of Giba, including Signor Piras, who's mentioned above. The soils are rather sandy and Carignano in this vineyard and cellar reaches a most interesting level of quality. We were first introduced to this producer while perusing the realm of Sicilian wines at VinItaly...We stopped to taste the wines of this winery and were pleasantly surprised to find a number of good wines...they make Vermentino, too, but it's the Carignane here that's stellar. Located in Campania, you'll find Feudi di San Gregorio in a sub-region known as Irpinia. This is a special micro-climate, not as hot as you'd expect for central and southern Italia. The place is named after Pope Gregory the Great. It was founded in 1986 by the Capaldo and Ercolino families and Riccardo Cotarella is their consulting enologist. The property comprises some 105 hectares. Their white wines are of a very modern, fresh style. I suspect the particular kind of yeast they're using may over-ride the actual varietal character if the grapes. I can't really distinguish between the aromas of their Fiano, Falanghina or Greco di Tufo wines. They all have similar fragrances and they all smell like tropical fruit, with the aroma of bubble gum. I've tasted a range of wines from Feudi from time to time. The whites, as mentioned, seem ultramodern and perhaps a touch sweet. The reds are nice, though certainly veering towards appealing to New World wine drinkers. The winery has received the most attention for its "Serpico" wine. This is an Aglianico wine which they say comes from fruit grown within the Taurasi region. It's an "IGT" designated wine, though. You'll taste the Aglianico, certainly, but it's also made in a modern, oak-aged style. We have access to many of their wines, so we can special order their other bottlings for you. Bruno Fina spent a decade working at the Sicilian Instituto Regionale Vini e Olio as an enologist and had the good fortune to become acquainted with the famous (former) Antinori winemaker, the legendary Giacomo Tachis. In 2005 Fina left the IRVV, as it's called, and launched his own winemaking enterprise, apparently with Tachis giving him some advice and assistance. His winery is just northeast of the town of Marsala in Western Sicily. We're fans of his dry white wine made of the Grillo grape. Sourcing fruit from a variety of sights, this is a remarkably showy wine which sees its fermentation partially in barrique and partially in cement tanks. When it's freshly bottled, the wine strikes us as showing peach-like fruit. As it develops in the bottle, it seems to take on a more pineapple-like character. It's a wonderful cocktail white and you can match it nicely with seafood or salads. This firm was founded in 1949 and in the 1950s organized a competition for designers to create a wine bottle for their Verdicchio. An architect from Milano named Maiocchi won the competition, creating a bottle in the fashion of an old amphora. This is Fazi-Bazzi's trademark today, some 50 years later! Their Verdicchio is a decently made, if somewhat anonymous tasting white wine. It has a touch of fruit when young and is dry and light...the bottle has more character than does the wine, though. You might know the name of these wines as "Regaleali," a famous brand of wine which for some wine drinkers equates to "Sicilia." The Tasca d'Almerita family has been cultivating vines on the property for more than 150 years and they've routinely been viewed as innovators in vine-growing as well as in the cellar. The name of the property, Regaleali, harkens back more than a thousand years, when Sicily was under Arab rule. The name comes from "Rahal Ali" and it means something like "Ali's Fortress." The estate is located a modest drive from Palermo and though most people think of Sicily as a hot climate area, you must remember that this estate is planted at its lower elevations around 450 meters (approximately 1476.38 feet). The higher elevation vines are at 700 meters (or about 2296.59 feet). As a result, despite the warm (or hot) temperatures during the day, aromatics and acidity are bolstered by cool night-time temps. This is one of their secrets. Though they cultivate many of the normal, indigenous grape varieties at Regaleali, the property also features famous French varieties such as Chardonnay and Cabernet. Lucio Tasca d'Almerita secretly planted these years ago and kept them a secret from his father who would have been upset. 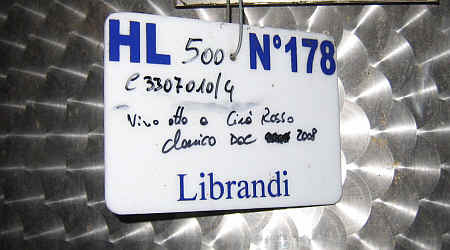 That's because these grapes were not permitted at that time and, of course, they're not "traditional" vines for Sicily. In my limited tasting of these, I can't say I've found Cabernet which rivals Bordeaux or Napa. Nor can I say I'm replacing white Burgundies or California Chardonnays with the Regaleali wine. They do make, however, some nice wines of traditional Sicilian grapes. Rosso del Conte is a notable "ambassador" from Sicilia and it's a blend of Nero d'Avola with, usually a small percentage of Perricone. It's an internationally-styled wine, being matured in French oak. Regaleali Bianco is a nice little dry white that's a blend of Inzolia, Cataratto and Grecanico...it's a pleasantly appley, mildly citrusy dry white that's a good aperitif wine and it sets up red wines nicely. Regaleali "Le Rose" is a dry pink wine made from Nerello Mascalese...It's lightly cherryish and also will set up a nice red. It's a refreshing wine for warm weather drinking. Regaleali Nero d'Avola, their basic red wine is a pleasant, simple rendition of this increasingly popular grape. It's not trying to be a grand vin and it's a medium weight, well-made, if unspectacular red wine. More interesting (and more costly) is their 2004 "Lamuri" wine, another rendition of Nero d'Avola. Now you're getting serious. This is a deeper, darker, more soulful wine. I found a fragrance of violets and it reminded me of some Australian reds which also have this floral tone on the nose. 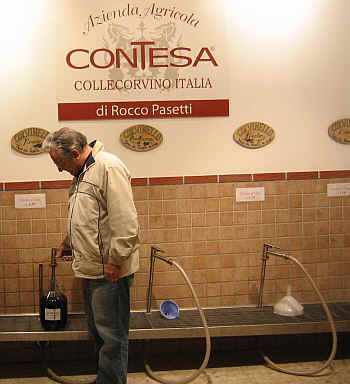 The 2004 Rosso del Conte is their "old vines" bottling of Nero d'Avola, essentially. It's more structured and tannic, with nice dark cherry fragrances and a woodsy element from its having been matured in a high percentage of new French oak. We can special order any of these wines for you...Give us a few days' notice, please. Tasca d'Almerita 2004 "Rosso del Conte"
The national company must have its headquarters in the Bermuda Triangle, as the Contesa wines have disappeared from the market! 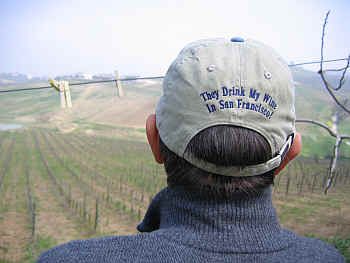 Winemaker Rocco Pasetti started his own winery after splitting from his brother's winery (the one posted below). The story, I gather, is not quite as juicy as the quarrels of the Mondavi's in Napa or Sebastiani's in Sonoma, but Rocco now has his own little enterprise and he's making some very good wines. In fact, the name "Contesa" stems from some sort of legal entanglement. It seems his grandfather, decades ago, had an issue with a neighbor over a troublesome tree (the roots were problematic for the vineyards) and a pig. Well, Rocco had an issue with his brother back in the late 1990s. I asked him if he owned the "tree" or the "pig." He declined to fall into this trap. The first vintage was 1998 and they have about 25 hectares of vineyards, including four clones of Montepulciano, one being an heirloom variety which provides, they explain, more structure as it's a bit "aggressive" in character. I've had several opportunities to taste through the range of wines and can see this fellow is our kind of winemaker...he's serious about quality and wants to improve with each and every vintage. The winery is in the final phases of construction and it's an immaculate cellar and it's located about 30-something kilometers west of the Adriatic town of Francavilla al Mare. It's out on the coast that Rocco has a small enoteca and "filling station." everyday red, white or rosato. If you're on a budget, we have Pasetti's "bulk wine" (the Italians call it "Vino Sfuso") in regular-sized, 750ml bottles. It's the same wine that feller in the photo above is pumping into his "Mio Vino" gallon jug. They were sale priced at $6.99. Meanwhile, the winery is about 35 kilometers inland and is surrounded by vineyards. A view from the road, looking back to the winery and its hillside vineyards. We have a number of good wines from Signor Rocco. There's an interesting white grape in Abruzzo which will remind some experienced tasters of good, flinty French Chablis. It's made of the grape called Pecorino. The grape takes its name from "sheep" which are called "pecora" (pecore is the plural). Apparently shepherds would herd their flock through pastures and vineyards and this particular, early-ripening white grape was a favorite of the sheep. As a result, it was known as "uva delle pecore" or "grape of the sheep." 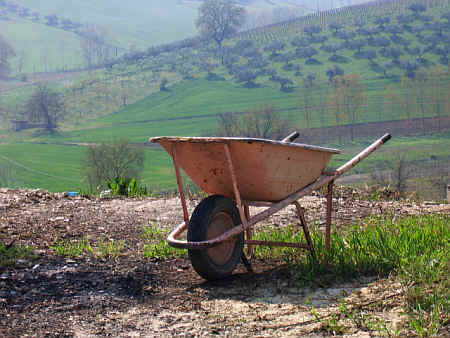 The Pecorino grape was near extinction and some growers in the Marche region worked to revive it. Now it's spread to neighboring Abruzzo and we've found good wines coming from Montepulciano producers. Our favorite is Signor Pasetti's, as the wine retains crisp acidity and it has some of the minerality one might associate with French Chablis wines. 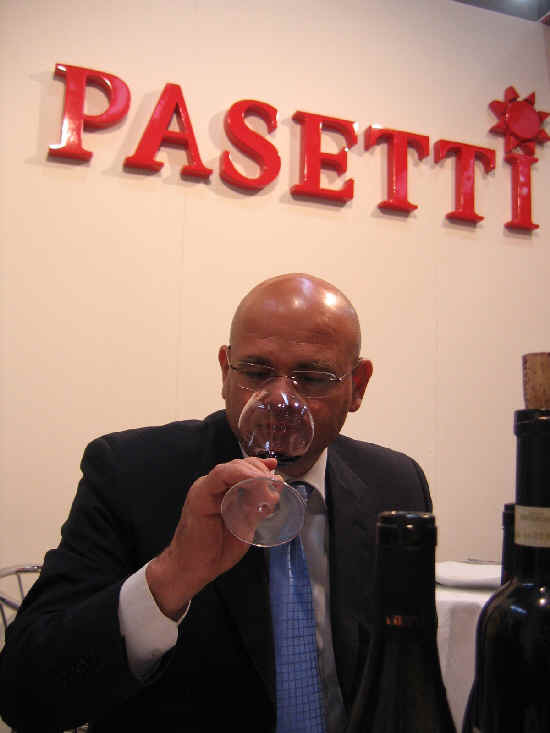 Pasetti makes good reds, as well. His version of his brother's "Testarossa" wine is called Nerone and it's a dark, inky, deep Montepulciano. It's a really satisfying wine on the dinner table and perfect for braised meats, roasts or grilled meats. The "basic" or regular bottling of Montepulciano is very good...a big, deep red with a whiff of oak and it's beautifully balanced in terms of tannin. If you find Chianti too light and/or too acidic, you probably ought to give this a try. 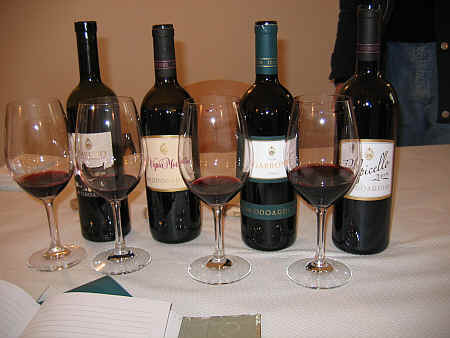 UPDATE: The 'Contesa family' decided to sell its wines through a national importer in late 2010. As of late 2012, new vintages have not become available as the "new & improved" company has yet to make its presence felt in California. UPDATE 2018: No news. Nothing. All quiet on the western front. Rocco and his daughter Perla and son Franco. 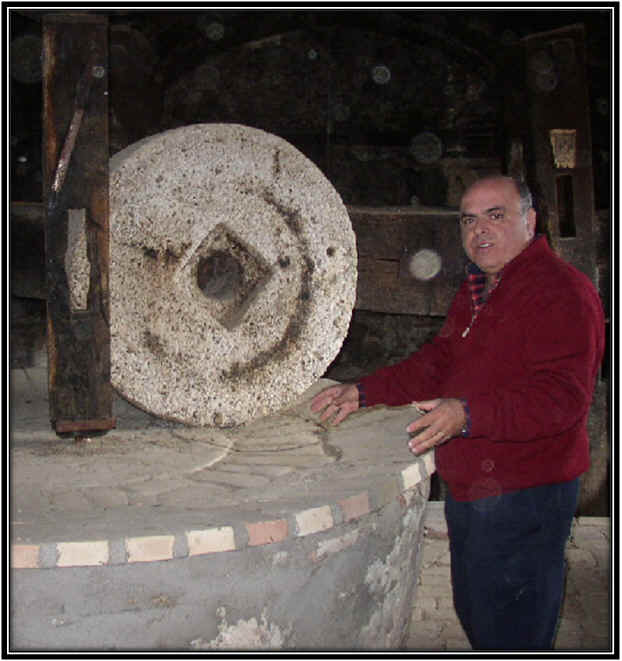 Located south of Naples and Salerno is this producer in Campania. The De Conciliis family has about 25 hectares of vineyards, producing a wine of the Aglianico grape which attracted our attention. This variety has nobility written all over it. Some people say the grape was introduced to Italy by the Greeks and was known as Vitis Hellenica and later as Ellenico before corrupting to Aglianico. The De Conciliis family makes about 40,000 bottles of a wonderfully berryish and mildly spicy (think white pepper) Aglianico called "Donnaluna." We've heard of the man in the moon, but apparently there's a woman up there, too. Medium-bodied, this is fairly smooth, so we like it served at cool cellar temp. It's perfect with grilled pork, but also big enough to stand up to well-seasoned lamb. The 2012 is currently in stock. We had skipped a few vintages...the wines simply did not strike us as compelling. Good wine! It's a delightful example of Aglianico, as has become the 'norm' over the past five or six years. It's versatile, pairing with pizza, pastas, sausages, etc. Good! Naima is Bruno's top Aglianico. We had it in a blind-tasting of Aglianico wines from Campania and Basilicata a few years ago and the wine ran away with the tasting...even alongside entries from Mastroberardino and Feudi di San Gregorio. The wine was extraordinary. Deep and dark, with wonderful wood scents. Complete on the palate and it demonstrates Aglianico can be a wine of top quality. More recent vintages have been "over the top" in our view...too ripe, too powerful...too much. And out of balance. For a guy who loves good jazz music, we wish he'd start making wines as "harmonious" as some of his early vintages. But the basic Aglianico is showing well and worth a try.